After only four months of twice daily program use, eighty-three 2nd, 3rd, 4th and 5th grade students (BAM), all with Dyslexia, ADD/ADHD and other Non-Specific Learning Disabilities had, on average, a 75% greater amount of reading progress as compared to a control group of non-learning disabled students from the same grades. According to the school principal, learning disabled children typically progress in reading ability only 25% to 50% the amount of non-learning disabled students over the same period of time. Showing a 75% greater improvement, with everything else being equal, shows substantial and significant progress as a result of performing Learning Breakthrough activities. All students were tested before the program began in January 2004. After re-testing in May, the non-LD control group of students showed a 45% increase in the percentage of correct test scores compared to test results from December 2003. The LD students who participated in the Learning Breakthrough Program, showed a 121% increase. This is an amazing reversal! Here are a few examples of the dramatic progress experienced by some of the students. "Of sixteen 3rd grade pupils, who were at risk of failing the state reading test, 9 passed during their first attempt and 3 more passed on the second attempt. One fifth grade child was only able to master 6 spelling words weekly after intensive studying before starting the program. Now this child is mastering 12 words during pre-tests and rarely has to study the words. He appears to have had the words in memory but failed to transfer the information into workable material. One autistic child, who was withdrawn before starting the program, is now known as a chatty, outgoing young boy. He visits up and down the hallways now whereas before he was very much to himself. We are so thrilled with these early results; we intend to have the entire 3rd grade (130 pupils, learning disabled and non-learning disabled) follow the program for the entire school year, beginning in September. Third grade students must pass the state reading test in order to be promoted, therefore, it’s critical that this grade level is targeted." says Mrs. Ratliff, principal of C. L. Milton Elementary School in Laredo, Texas. Mrs. Ratliff also used the program at home with her son, who improved 2 years of reading level after only 6 months of program use. He was a third grader at the time, labeled gifted and talented, but in danger of failing the state reading test and thus being retained due to reading deficiencies associated with dyslexia. He passed both the reading and math state tests on the first attempt in spring 2004. "I had looked at everything I could find, and the balance and sensory exercise Learning Breakthrough Program made sense to me, so much so that I took the leap and put it in my school. My goal was to help other parents who I knew from experience were as frustrated as I was and who were additionally desperate to help their children succeed. It’s devastating to see you’re your own child depressed, frustrated, and losing self-esteem by the minute. The same thing had been happening to many children in my school and I just couldn’t sit by and do nothing to help them," said Mrs. Ratliff. Maximum and lasting results need 9 to 12 months of consistent and proper use. Mrs. Ratliff was told by Learning Breakthrough LLC not to expect too much with only 4 months use. However, the data from before and after reading tests were astounding. The program, testing, data capture and analysis were all administered and compiled by school personnel. The Learning Breakthrough Program, which was first published in 1982, was revised in 2003 to be easy to use by the average parent. It is best-used one on one, parent to child. However, not all parents can or will take the 15 minutes, twice each day to work with their child. The next best thing is a group program in the schools, just like the one at C.L. Milton Elementary School in Laredo, Texas. As mentioned on our Dore Comparison page, the background of the Dore Center's activities derive from examples set forth in Frank Belgau's original work which was first published in 1982. The research summary can be viewed in its originally identified format by going to http://www.ddat.org/research.aspx. At the bottom of the page, click on "Research Study 3". Beginning at the bottom of page 8 and then again on page 31, the authors make reference to the influence Dr. Belgau's Learning Breakthrough Program had on the development of the exercise program that was the subject of their initial exploration and published research. The methodology and techniques of that exercise program are owned and employed by DDAT and not by Learning Breakthrough. We do not endorse, recommend or have any connection with the DDAT exercise program, nor should you expect the same or attribute the results of the study from the use of our program. 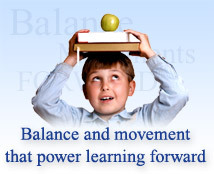 We provide this information to show how others have used and benefited from a program that includes balance training and as an example of how the principles behind the Learning Breakthrough Program have influenced the development of other programs' methods and techniques.